Want to be notified of new releases in erichson/rSVD? Randomized singular value decomposition (rsvd) is a fast probabilistic algorithm that can be used to compute the near optimal low-rank singular value decomposition of massive data sets with high accuracy. The key idea is to compute a compressed representation of the data to capture the essential information. This compressed representation can then be used to obtain the low-rank singular value decomposition decomposition. 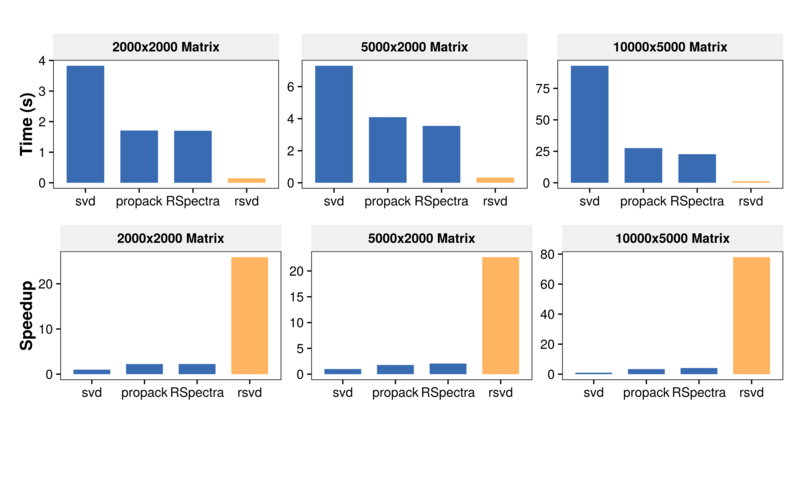 The rsvd package provides one of the fastest routines for low-rank matrix approximations in R, as far as we know. The singular value decomposition plays a central role in data analysis and scientific computing. The SVD is also widely used for computing (randomized) principal component analysis (PCA), a linear dimensionality reduction technique. Randomized PCA (rpca) uses the approximated singular value decomposition to compute the most significant principal components. This package also includes a function to compute (randomized) robust principal component analysis (RPCA). In addition several plot functions are provided. See for further details: “Randomized Matrix Decompositions using R”. The source packge can be obtained here: CRAN: rsvd. Support for non-default matrix types to deal with large-scale matrices that are held on file, added by Aaron Lun. Fixed a bug which occured runninig rpca with k=1 and retx=TRUE, discovered by Will.